Note: Figures in this blog post were adjusted on December 12, 2017 to reflect the increase in capital cost for the Site C dam (from $9.1 Billion to $10 Billion). In addition, the calculations regarding the number of solar panels and associated costs that would be involved to generate the equivalent amount of electricity were changed to use cost and production data from the Sun Mine in Kimberley now that almost 2 years worth of actual data is available. This is the most likely multi-generational cost of electricity from Site C. That should be compared to the $68/MW-Hour paid for Private Power Purchases that BC Hydro was forced to negotiate with for-profit companies. For a full discussion of how this number was calculated see my previous post on LCOE for hydro projects. This is the total annual electrical generation from existing legacy Hydro assets in BC. Site C will add 5 TW-Hours. The cost to install those solar panels – and we still would have no power at night. The cost to install those turbines which would have to be located on pristine mountain-tops causing significant habitat destruction – and we still would have no power on the frequent days when winds are calm across BC. Note also that the best wind resources in the province are on the north section of Vancouver Island and Haida Gwaii. Installation of a larger number of wind turbines in these areas would likely encounter significant protests from environmental groups. If we think we’re going to need additional electricity capacity in the future why wouldn’t we build Site C now when interest rates are low? Do we think construction costs are going to decrease in the future? Available form the BC Hydro web site. This is an average value over the next 100 years with the first 30 years running at $107/MW-Hour while the capital costs are paid off through a bond bearing 4.5% interest and the next 70 years only with operating costs initially at $10 million/year escalating with a 1.5% rate of inflation. Details can be found in a previous post. Gasoline sales from Statistics Canada. Conversion to TW-Hours: 4.6 Billion liters of gasoline = 4.6 * .264 = 1.214 Billion U.S. gallons. The energy content of this is 33.7 KW-hours/U.S. gallon. Therefore the electrical generation required to replace the burning of gasoline is 1.214 Billion * 33.7 KW-hours = 40.9 TW-Hours. Second source: 34.2 MJ/liter x 4.6 Billion liters = 157 Billion MJ = 43.68 TW-Hours. To be perfectly fair electric vehicles are considerably more efficient than internal combustion engines but I have not included the 1.8 Billion liters of diesel fuel which has a higher energy content than gasoline and I have not accounted for any growth in the number of vehicles in BC in the next 100 years so I believe the 40+ TW-hours of needed electricity generation growth is very conservative. Consumption of 5 Billion CM from BC Government spreadsheet. Multiplying by .0373 gives .1865 Billion GJ and dividing by 3.6 gives .0518 Billion MW-Hours or 51.8 TW-Hours. Second source: 5 BCM natural gas x 35.7 converts to 178.5 Trillion BTU which is the equivalent of 52.31 TW-Hours. Site C is estimated to generate 5 TW-Hours of electricity per year which translates into average generation of .582 GW (5,100 GW-Hours/24*365). The Sun Mine located in Kimberley came on-line in 2015. It is a truly amazing complex and represents the absolute best case scenario for solar in BC. Located in the southern part of the province with excellent solar resources and mounted on dual axis tracking racks, the Sun Mine achieves summer time capacity factors of 30% – better than Hawaii (by comparison the OASIS project at BCIT in the lower mainland has reported estimated capacity factors ranging from 2.8% in December to 14.2% in August). The problem is that maximum electricity demand in BC is in the winter. During the months of December and January the Sun Mine has produced a total of 249 MWh over the past two years. During that time Site C would have produced about 1,700 GWh of electricity, almost 7,000 times as much if producing at a capacity factor of 55%. The Sun Mine facility includes 4,000 solar panels. Therefore the number of solar panels required to match average Site C production is 4,000 x 7,000 = 28 million. The Sun Mine cost $5.3 million to construct. Therefore to generate as much electricity as the average Site C output from solar would cost on the order of $5.3 million x 7,000 = $37 Billion. Even this estimate for the cost of solar to replace Site C is far too low. During the winter months Site C is likely to be producing at much higher capacity factors than the 55% average. Based upon the Sun Mine, the cost for solar to fully replace Site C at maximum production would be over $65 Billion. In order for solar to be available for the peak demand hours on cold winter nights some form of energy storage system would have to be used. At current prices the cost of battery storage would add another $4 Billion to the total. Modern wind turbines vary in nameplate capacity from 2.5-3 MW. Average capacity factors for wind turbines in Germany, which has 47 GW of wind generation capacity (largest in the world) can be calculated from total generation of electricity of 77.8 TW-Hours to be 19%. The EIA reported a capacity factor of 34% for U.S. wind generation which is concentrated in very good wind resource areas in Texas and the prairies. 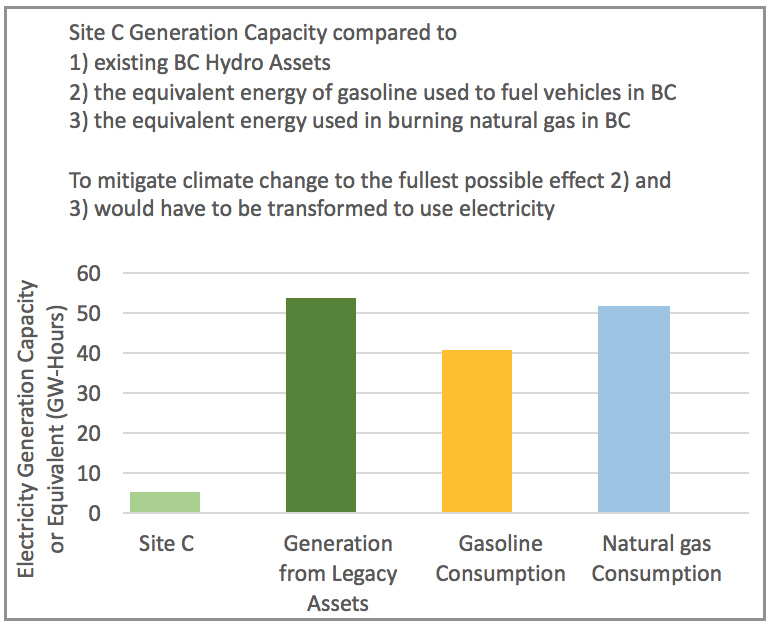 On balance it would be reasonable to assume that large scale development of onshore wind in BC could achieve a capacity factor of no more than 30%. Under that assumption the wind capacity required to match Site C would be .582/.3 = 1.94 GW which would require the installation of between 650 and 750 wind turbines. As reported by the EIA the average cost to install wind generation is $US1.9/watt which would translate into a cost of $4.81 Billion using current exchange rates. However, the average cost of installation in BC is likely to be considerably higher than the average cost of installation in the U.S. because of the mountainous terrain and the location of the best wind resources in relatively remote areas. The largest battery complex in the world is being installed in Australia in response to a regional blackout that took place when a large wind farm stopped generating quite suddenly due to high winds. The capacity of this complex, the cost of which has not been revealed but has been estimated at $50 Million, is 139 MWh. The capacity of Site C is 1,100 MW. Therefore the theoretical equivalent time that the battery complex could replace Site C is 139/1100 x 60 minutes = 8 minutes. The battery complex can only produce 100 MW output so to be absolutely accurate it should be stated that the battery complex could produce 9% of the output of Site C for 1 hour and 23 minutes.